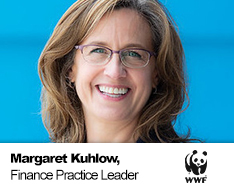 Margaret L. Kuhlow leads WWF’s Finance Practice, providing strategic direction and thought and content leadership to WWF’s global engagement with the finance sector. Before joining WWF, Ms. Kuhlow was Vice President of Investment Policy at the Overseas Private Investment Corporation, and was a member of the team that established and implemented the U.S. Government’s Millennium Challenge Corporation, leading the new agency’s approach to environmental and social assessment of major investment projects. In her 25-year career she has lived and worked extensively in developing and emerging markets, and has broad sectoral experience in sustainable investment, project finance, and grant making. She holds a Master in Public Policy, International Trade and Finance, from Harvard University’s John F. Kennedy School of Government.